There has been no lack of disasters taking place in 2015. Some can be classified as "natural" others as human caused. In all cases, anyway, they are an indication of the stress felt by the ecosystem and by the economic system at the same time. We are, finally, reaching our limits as we knew we had to, from the time when we were warned, in 1972, by the study titled "The Limits to Growth." But not everything was bad in 2015 and, in this post for the end of the year, let's concentrate on the good things that happened. If we do that, we see that 2015 has been a very special year. Not that any of the big problems we face has been solved; but there is something new going on; something unexpected, but that may give a boost to a new direction that the world may take; a direction that may lead us to a better world. We may be learning something, after all. - The Papal Encyclical on climate, the "Laudato si'". This has really been something big. For one thing, it was clear from the way it affected the debate. Mostly, climate scientists, and scientists in general, are no-nonsense people, often atheists or agnostics, rarely churchgoers. So, the arrival of the Pope in the debate took them by surprise: "The Pope? What? Does he agree with us? Really? He said that God orders to us to safeguard the creation..... Eh....?" You can't imagine how happy these solemn scientists were; like children receiving a Christmas gift in August! But the main effect of the Pope's encyclical has been on the anti-science camp. They were, clearly, in difficulty. As a reaction, they could have demonized the Pope, saying that he is a communist, or he is possessed by the devil, or something like that. Some weirdos have done exactly that but, by far and large, the mainstream anti-science camp has decided that their best (and probably the only) strategy was to keep a low profile and hope that the "Laudato si'" would be ignored and then forgotten. It wasn't and it won't. The effect of the encyclical has been large on the public's understanding of climate change. It is an effect that's continuing and that can only increase in the future. - The COP21 climate conference in Paris. I know that many people say that not enough has been obtained, which is true. But it is also true that the conference has been a success mainly in showing the marginality of the anti-science camp. They had spent so much money trying to demonize science and scientists, trying to ridicule climate science, spreading various conspiracy legends and then, what? They found that the delegations of 190 countries in Paris declared that climate change is real, it is human made, and something must be made to stop it. Now, think about that: if you were in their shoes, how would you feel? That's the main reason why the Paris conference was a remarkable success. It was just a first step, of course, but you can't go anywhere without a first step! - The collapse of the oil markets. At first sight, low oil prices would seem to be exactly the opposite of what we need to fight climate change. But that's not the case: think that we have been telling people that we need to "leave oil in the ground" without much success, so far. But now low prices are doing the job for us by making extraction unprofitable! The low oil prices of 2015 show the impossibility for the market to keep producing from expensive (and dirty) sources such as shale oil. 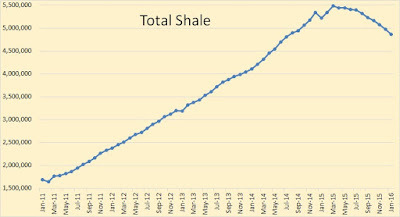 As a consequence, the shale oil industry giving out its death rattle and we are facing the start of the terminal decline of the world's oil production. That will carry with it the decline of all fossil fuel production. The importance of this event can hardly be underestimated. It means that the decline in emissions is likely to be much more rapid than anything that was even vaguely imagined at the COP21 in Paris and that the scenarios contemplated in the INDCs (Intended Nationally Determined Contributions) will soon be as obsolete as flying cars and nuclear water boilers. The emission decline could even take the shape of a "Seneca Collapse" that might stop the growth of greenhouse gas concentrations short of the dreaded climate "tipping point". That would surely be a good thing but, of course, a Seneca collapse of the world's energy production would be a major disaster in itself; possibly able to destroy the world's economic system. But there is a middle way: the Seneca effect could help us manage to sharply curtail fossil fuels use, but not so much that we would be left without the resources needed to build a new energy system based on renewables. It is difficult, but not impossible, as shown by quantitative calculations. Of course, things might go wrong in other ways. For instance, a major war could push up the need of fuels and cause the oil industry to restart extracting resources that a market economy cannot extract. It is possible, indeed, that the current drive for war is the result of exactly this kind of considerations. Nevertheless, war is not unavoidable and, if we manage to avoid it, then 2015 may be remembered as the year when everything changed. A year of hope! 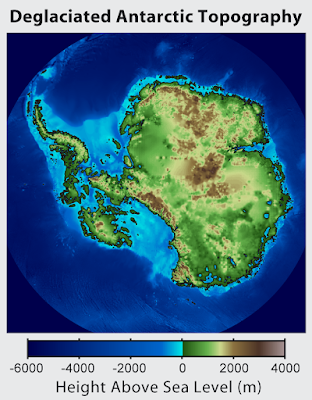 Antarctica deglaciated and uplifted, as it could appear ten thousand years after the Great Warming of the 21st century (from global warming art). The text below is part of my cli-fi novel "Queen of Antarctica" that one of these days I might be able to publish, somewhere. The novel takes place in a remote future and it is based on the idea that, after the runaway climate change of the 21st century, the survivors managed to colonize the extreme North and the extreme South of the planet, including Antarctica. And here is how their remote descendants living in Antarctica would tell the story. Note that the story assumes a relatively warm Antarctica, but it reflects the peculiar conditions of a civilization living near the South Pole that would experience six months of light followed by six months of darkness.In this world, people would spend the dark winter in a sort of hibernation. For them, seeing the stars in the dark sky would be something special, worth celebrating. Children, come. Come here, because this is a special night. It is the night when the Moon is highest in the sky, and the night when the Moon starts to go down and, slowly, to let the sun come back, and give us light again after the long winter night. And we call this night the night of the winter solstice. So, children, you have been sleeping through the long winter night, but now you are awake, and it is good that you are awake because this is a very special night. It is the night when we all wear heavy clothing and we go out to look at the stars! Yes, children, the sky is dark during the solstice night, and this night is darker than all the other nights of the year. So, we go out and we look at the stars, and at the moon, and at the planets above us. It is beautiful, and many of you have already seen it, and some of the youngest among you see the dark sky for the first time because they were too young to go out the last solstice. But before we go outside to see the stars, children, it is the time for me to tell you a story. I'll tell you the story of the land where we live, that we call Antarctica; and of the city where we live, that we call just the city. And it is for me to tell you this story because I am the oldest woman of the city and some say that for this reason I am a wise woman, and some call me witch because I know many things. And this may be true, though all what I know I learned from other wise women who came before me, just like you, children, are learning this story from me. And maybe, one day, when you'll be old as I am now, you'll be telling this story to the children who will be here in front of you, because this is what has happened in our city for a long, long, time, since it was founded long, long ago. So, children, listen to me. You know that the world was created when the Goddess separated the waters from the land, and then the She created the Sun and the Moon, and She made the Sun so that it would shine light on the land during half of the year, and She made the Moon so that it would stay in the sky for the other half of the year, and then the cycle would restart. And it is the light of the Sun that makes grain grow and makes us live. And then, it is the time for the Moon to be alone in the sky, then the land rests, and the people of the city rest, all the creatures of Antarctica rest, ready for the new cycle to start. And then the sun comes back, the snow melts, and grain grows again for us. But, children, you must know that Antarctica has not been the same forever. This is an ancient story that comes from the time of the founders and that the wise women of the city have kept by telling it to one another for a long, long time. And the story says that long, long ago, Antarctica was not the same as it is today; no, it was colder. Much colder than it is today. And that was so long ago that it is difficult for us even to imagine. It was not centuries ago, it was not millennia ago. No, it was some ten millennia ago, and some say it was more than that. And, at that time, Antarctica was covered in ice, by mountains of ice! They say that the tip of these mountains of ice was as tall as the mountains you see today. So tall that and so big that nothing of what you see today was visible. The land where now our city stands was covered in ice, and the grain fields around the city were covered in ice. Everything was covered in ice. Long, long ago, ten thousand years ago, when Antarctica was covered in ice, no one lived here: no plants, no animaps. People lived far, far away, on the other side of the sea. And the lands in which they lived were not so hot as they are today, and people lived there. And people had built cities there, great cities with tall buildings. But those cities don't exist anymore and the people living there are no more. It was because of something terrible that happened and that the founders called the Great Warming. Some say that it was the will of the Goddess that caused the world heat up so much that so many people died and they say that it was because people had become too proud and they were not paying to the Goddess the respect she deserved. But the founders say otherwise and they say that it was the fault of the ancient who had done something that had caused the Great Warming without knowing what they were doing. The founders said that the ancient had found something underground, a dark stuff that they could burn as if it were wood, but that was not wood. They dug it out and they burned it to warm themselves, to cook, and to smelt metals. And this dark stuff was easy to find and easy to burn, so they burned a lot of it. And they burned so much of it that it poisoned the air and made it warmer. It was like when you warm yourself in a sealskin and it may be too warm for you if you do that during the summer. And this blanket made the world much hotter than it used to be, and it covered the whole world. The founders say that the wise among the ancient understood what was happening and warned the others, but that the ancient did not believe what the wise people were telling them and so they didn't want to stop burning that dark stuff, and that was perhaps how they offended the Goddess, as some people say. So, they kept burning that dark stuff and the world became hotter an hotter. And then, the founders say that something came out of the depth of the earth, something that made the air even hotter and did it faster, so fast and that could not be stopped, no matter what the ancient tried to do. And that was the Great Warming that some say was a punishment sent by the Goddess. When the great blanket of ice that covered Antarctica felt the heat of the Great Warming, it started melting. And all this ice that melted went into the oceans as water, and the oceans rose. And the cities that had been on the coasts of the continents in the North were submerged, and the people who lived in those cities had to move inland, and they didn't have enough food to eat because the Great Warming had dried up much of the land, and many places were too hot for people to live. So, many of them died, many, many of them. And those who survived migrated to the Northern Lands, where they say that their descendants still live today, although it is so far away from us that nobody has been there for a long, long time. Here, in Antarctica, when the ice melted, much of it crashed into the sea very fast, because the great ice sheets slid over the water under them, and they moved very rapidly and, soon, there were great stretches of land in Antarctica that were free of ice. But there was nobody living in there because nobody had ever lived in Antarctica up to then. It was at that time that the founders came. They came from the North, they were some of those who had survived. They came by boat, and it was a difficult trip for them, because the currents that circle around Antarctica were strong and dangerous at that time and they are still strong and dangerous today. But they crossed the Antarctic Ocean and they landed in the land that we call the Peninsula, even though it is an island, because at that time it was connected to the mainland of Antarctica. The founders came, and they came to Antarctica to settle. They were wise and learned, they brought tools and machines that today we don't know anymore how to make. And they brought animals with them that we don't have anymore because they died and so, still today, Antarctica has no other animals than the birds who flew here by themselves; and the creatures who swam here by themselves, seals and iguanas, and others. It was a difficult time for the founders because the land was bare, there were no plants and no animals, and the sea was growing in height as the ice kept melting. But the founders were resourceful and they had brought seeds with them, and they sowed grain, and they planted trees on the land left free by the ice. In time, there was no more ice on the land of Antarctica, and much of the land was submerged and under the sea. But they also say that, slowly, the land rose, little by little the waters receded. It took many centuries, millennia, and the land is still rising, but much more slowly by now, so that Antarctica is now the way we know it; without ice, and with its coasts that fall rapidly into the sea. And while the ice was receding, the founders moved inland and they built cities and they built the city in which we live today. We live in this city and we remember the old times, and we remember of the founders, and we remember the things that happened so long ago. And some say that, one day, the ice will return; and some say that in the mountains, something is now happening that never happened before; and it is that when summer is at its height, there still remains a little snow on top of the mountains. And some say that the snow will grow and it will become ice. And that, one day, Antarctica will be covered with ice again. But that will take a long, long time, longer that we can say, longer than we can ever imagine. If that happens, then the people of the cities of Antarctica will have to move to somewhere else, because things always change and as the founders came here, so long ago, we can go back to where they came from, if that will be necessary. But now, children, it is time to go. It is the solstice night, and you'll come with me and we'll go outside; to see the stars. The stars that you never see during the summer, the stars that come out when we are all sleeping during the winter, the stars that we see together in the night of the solstice. And you'll see the moon shining bright, and bright stars that the ancient told us are not stars but are called planets. And you'll see how beautiful is the dark sky, how beautiful is the moon, and how beautiful are the planets! Then, children, you'll go back inside, and you'll be warm and comfortable in the city until the next cycle starts and the sun comes up again, and this is the cycle that keeps us alive, and it has been going on like that for a long, long time, and it will keep going like that for a long long time. And you'll grow in this city, children, you'll become adults, and then you'll become old, and then you'll go dreaming underground. And then you'll become grain, and then you'll become bread, and then you'll become people again. And that's the great cycle that was created by the Goddess, as it has been, as it is, and as it will be for a long, long time to come. May the Goddess bless you, children! And now come with me, to see the stars! They say that a journey of a thousand miles begins with a single step. The COP21 climate conference in Paris could have been just that step. So, there is hope. 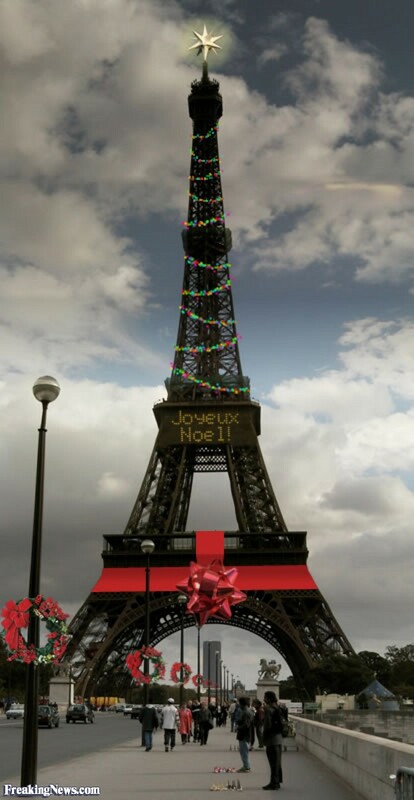 This Christmas is a Christmas of hope. Peter Turchin's book deserves to be devoured in a few hours, and that's what I did. But, I emerged out of it with a sensation of disappointment (*). Possibly it was unavoidable: all the books that attempt to explain everything are destined to fall short in one way or another. But, surely, this is a book worth reading. The concept of "ultrasociality" is becoming increasing popular as a tool to understand the characteristics and the evolution of human society. It is a concept taken from evolutionary biology that describes how some species attain evolutionary success by means of collaboration among individuals. The extreme form of this idea is found in social insects; ants and bees, whose behavior is usually termed "eusociality" ("the good sociality"). Humans don't arrive at the degree of hyperspecialization of some insect societies, but they are more socially specialized than most mammals, hence the term "ultrasociality". The idea that collaboration is a fundamental factor in evolution is becoming more and more popular in biology. We are seeing the decline of some rather restrictive concepts that described evolution strictly as the result of individual competition alone. In the past, these concepts led to the idea that life was a battle of everyone against everyone else and the idea spread from biology to other economics and to politics. The consequence was a series of egregious disasters; for instance, the development of a style of management that encourages people in engaging in cutthroat competition with their coworkers. An example of how disastrous this idea can be is that of the management of Enron by Jeff Skilling, presently in jail for various felony charges (as described in Turchin's book). Examining history in terms of ultrasociality, as Turchin does, turns out to be very rewarding. 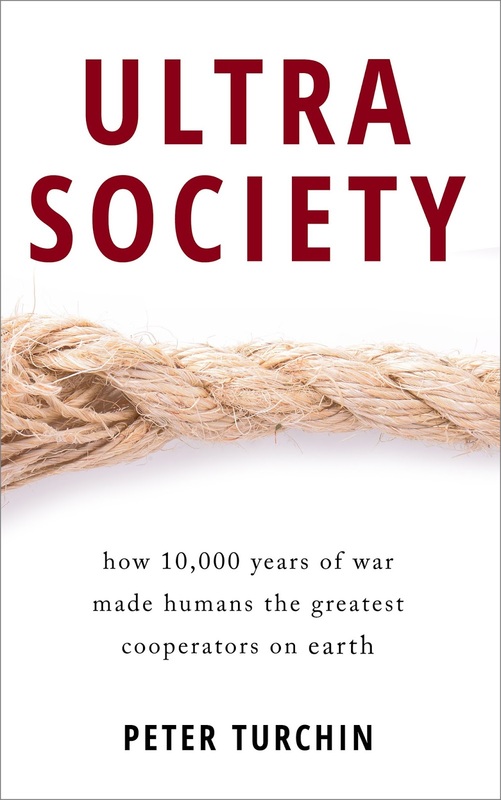 Indeed, the evolution of human societies can be seen as the result of a competition where victory goes to those societies whose members can collaborate better. 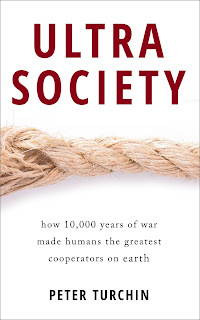 So, cooperation among humans is good and Turchin notes that, over history, human societies have been increasing the level of collaboration among their members, just as they have increased in size and complexity. One of the results has been a remarkable reduction of their level of internal violence. It is becoming clear that the image of the "good savage", still popular in many quarters, is deeply wrong. Life in ancient society was much more dangerous than it is nowadays in our world, despite our fascination with the idea that all problems can be solved by carpet bombing someone. Collaboration allows to create and manage more and more complex social structures. But that has a cost, as Tainter noted in his book "The collapse of complex societies". If this cost is worth being paid, there must be some returns from the deal. Turchin's thesis in his book is that it is mainly military competition that favors the larger size and complexity of a society. 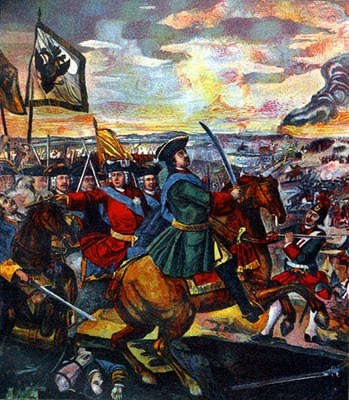 Turchin notes that a large army will normally defeat a smaller army and, evidently, a larger society can field larger armies and, therefore, will tend to gobble smaller neighbors, one by one. Villages beat foraging bands. Cities beat villages. States beat cities. Large states beat small states. Empires beat large states, and so on. There is no doubt that Turchin's point about the importance of military factors is fundamental and that it is often underestimated in our times. We live in a largely demilitarized society and it is difficult for us to understand how war and military structures were permeating the life of our ancestors of even just a century ago. But they were extremely important and, for most of human history, there has been no such thing as "pacifism" on record. Pacifist societies, if they existed, were wiped out of the map by less pacifist societies. Yet, no matter how important war may be in the evolution of human society, putting war at the center of the model, as Turchin does, misses something even more fundamental. Yes, war is important, but, just like complexity, war has a cost. And if the cost of war is to be paid, there has to be a return. What kind of return does war bring? Here, I think we must emphasize that most wars, if not all, are for the control of economic resources. And when we start thinking in terms of resources, we see that war is important, but just a facet of the whole system. The key point of this idea, I think, is that societies become ultrasocial not just because they can grow bigger and hence have bigger armies. No, they go ultrasocial because they need a certain size and complexity in order to optimize the exploitation of the resources they use. Let me explain this point. Think of a band of foragers in a hunting and gathering society. The optimal size of such a group is probably around 100-150 people; a dimension honed to perfection by hundreds of thousands of years of testing: there has never been an empire of hunters and gatherers! Of course, bands may make war against each other and, in this case, size is surely an advantage, but, as Tainter taught to us, there are diminishing returns to complexity. There will be a band size over which the military advantages of size are overcome by the growing inefficiency in foraging. A group of foragers that's too big will simply split in two. Think, instead, of an agricultural society. In this case, the optimal size needed to exploit agricultural lands is much larger than that of a foraging band. An agricultural society needs specialized people: priests, kings, armies, craftsmen, and so on. And these people need to be housed, fed, and organized. That, in turn, leads to the appearance of the structures we call "cities". The optimal size of a purely agricultural city may go from villages of a few hundreds of individuals to relatively large cities of 10,000-100,000 inhabitants. These cities may fight for the control of the land and, obviously, larger cities may triumph over smaller ones. Again, however, we have limits to the size that an agricultural city can attain because of the increasing costs of transporting from the surrounding fields. Agricultural cities may form federations in order to field larger armies, but the fundamental social unit in a purely agricultural society remains the city-state as, for example, it was the case in ancient Greece. The coalescence of cities into truly organic states requires different resources than those provided by a purely agricultural economy. In particular, states and empires seem to be the result of the exploitation of mineral resources. These resources are highly localized and need specific military and political organizations to be exploited and that involves a cost that may well be too high to be paid by a single city. Mineral resources also generate commerce and a network of exchanges that favor the formation of a corresponding political and military network. So, most empires of history have been mineral and commercial empires. The best example is probably that of the Roman Empire that grew on the exploitation of its gold mines and whose structure was based on the use of gold to pay for its large (and almost always victorious) armies. The modern empire that we call "globalization" was created for the management of the complex financial and military structures that control the exploitation of fossil fuels. And there is more than just fossil fuels to be managed and controlled: the complexity of our modern world is in large part the result of the complexity of the worldwide mining system that provides the world's economy with all the elements of the periodic table, packed and shipped to destination, something that the ancient couldn't even dream to have. The most interesting result of this kind of view is that it can be used to understand what could be the future evolution of our society. We are, clearly, the most complex ultrasocial society ever having existed in human history. We may think that the trend in more ultrasociality and more complexity will continue but, if complexity is the result of the availability of mineral resources, then it will follow the cycle of mineral resource exploitation. It is a grand cycle that started millennia in the past, that is now at its peak, and that is likely to start winding down slowly in the near future. With the gradual depletion of the cheap, high-grade mineral ores, the flow of mineral resources to the world's economy is destined to diminish. That would make increasingly difficult to maintain the complex structures that we have created in our society. 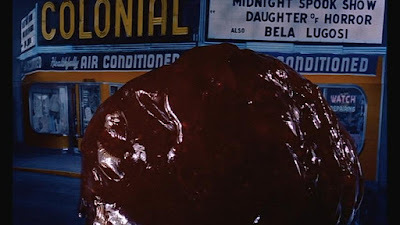 In the long run, on a planet where high-grade mineral ores have mostly disappeared, there won't be the need any longer for large organizations dedicated to exploiting them. We seem to be seeing the start of this phenomenon right now, in front of our eyes, with the globalized empire facing increasing troubles in maintaining the control of the mineral resources that created it. We may speculate on what could be the long-term results of this process. One could simply be the return to a purely agricultural society and to the size of social groups to the level of city-states. That's what happened when the Roman Empire turned itself into medieval Europe. But that's not necessarily our case. Imagine a society based on solar energy produced by photovoltaic panels manufactured using common and abundant silicon and aluminum. It would not need to exploit high-grade mineral resources in order to have abundant energy available. It would have electricity and, as such, long distance data transmission and some kind of cheap, long range, transportation system. At the same time, it wouldn't need militarized structures in order to control the sources of its wealth. So, what kind of society would it be? A world empire or a federation of city states? How complex and "ultrasocial" would it be? That is, of course, impossible to say, but we can say that over the long term, human history doesn't repeat itself but, rather, evolves into different and more complex forms. This is the fascination of history as a guide for the future. 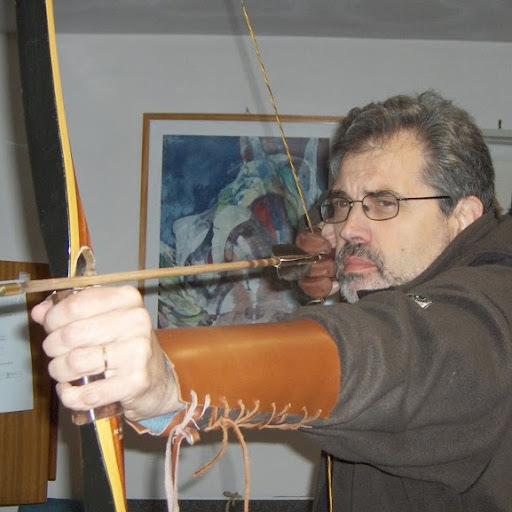 (*) Peter Turchin is known as the proposer of the concept of "cliodynamics," the idea that the study of history must be based on quantitative data. As he says in a paper on "Nature"
We must collect quantitative data, construct general explanations and test them empirically on all the data, rather than on instances carefully selected to prove our pet narratives. To truly learn from history, we must transform it into a science. It is, of course, an excellent idea, but it has practical problems. For instance, I have been exploring the concept that many, perhaps most, societal collapses are related to resource depletion, and in particular to the depletion of mineral resources. Yes, but where to find the data to prove this idea? For instance, no matter how much I would love to have the data sheets for the production of the Serbian tin mines during the bronze age, these data are simply unavailable. And so, the idea that the collapse of the Mediterranean bronze age civilization was caused by a shortage of tin must remain just that: an unproven hypothesis. This is a problem for Turchin himself in this book, "Ultrasociety." In it, we find in it very little in terms of quantitative data or models; for instance, it doesn't contain a single table or graph. And while Turchin says at the beginning that he is interested in understanding the quantitative reasons for societal collapse, then he never gives a clear answer to the question. In the end, Turchin's book is not so much different than most history books: it moves on the basis of events, examples, anecdotes, and out of these it builds up generalizations that appear reasonable. That may be seen as a defect, but it doesn't detract from the basic intuition of the book about ultrasociety, that makes it innovative and worth reading. 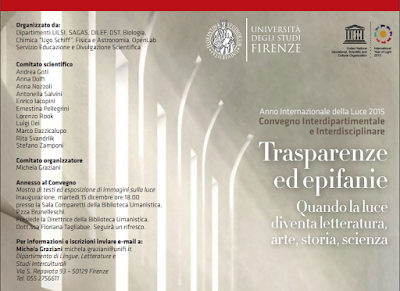 It was yesterday that I gave a talk on climate at a meeting in Florence. It was a rather formal meeting, in the "Aula Magna" of the University of Florence, and my talk was part of a multidisciplinary series of lectures. I gave my talk to a public mainly composed of faculty members, although only some of them were physical scientists. It was not a specialized talk, but I tried to explain the basic elements of what we know about the earth's climate. How more than a hundred years of research has led to developing a new understanding of what makes climate change. I said that it is a true scientific revolution, on a par with several others as - say - cosmology; linking to a talk given just before by a colleague. I showed data about how, over the geological eras, greenhouse gases have been the main element (although not the only one) determining the earth's surface temperature. And I showed how temperatures are rapidly rising now as a result of human-generated carbon emissions. I described the risks we are facing, and the importance of acting as soon as possible. And I showed my own work on modeling the energy transition to renewables. And that was it. I received some applause, then the conference went on. Later on, there was the coffee break; the speakers and the public collected in the open air, in the courtyard of the University's central building. And, there, someone, a colleague, patted me on the shoulder. He smiled at me and he said, "See, Ugo, how cold is it today? Don't you think we need some global warming?" Sometimes, I have lost my temper in these occasions. And they tell me that when I truly lose my temper I am not nice - which I think it is the way things should be. This time, however, I just smiled and I moved onward. But words were ringing in my head, "an idiot is an idiot is an idiot", something that Gertrude Stein could have said hadn't she been thinking of roses, instead. You could say, "it was just a joke." Yes, but imagine that you were a surgeon, and you gave a talk at a conference on - say - childhood cancer. Then, at the coffee break, a colleague of yours pats on your shoulder and says, "See how many children are there? Isn't it good that some are killed by tumors?" An idiot is an idiot is an idiot. The problem is that there isn't just one of them. Before the COP21 meeting, I expected that the agreement that was to be signed would be something like the one that was actually signed. And I saw myself taking a position similar to the one taken by James Hansen and others: I thought I would have joined those who are now screaming "hoax!" But no; after some thinking over the matter, I had a minor enlightenment. The Paris agreement is a victory. Maybe not a great victory, because from a technical viewpoint it is certainly insufficient. But, in communication terms, there is no doubt that it is a victory. Put yourself in the shoes of those who have been pouring millions of dollars into "perception management" on climate (that is, good old "disinformation"). They might have thought that, after the Climategate story, after the demonization of Michael Mann, of Al Gore, of Phil Jones, and of many others; after that all the Republican candidates were convinced to refuse to admit that climate change is human caused, after the Trumpcane, and more things, then, the idea of human-caused climate change would be erased from the collective consciousness and its proponents reduced to the same level of prestige that Saddam Hussein enjoyed in the West when he was president of Iraq. And yet, climate science is not dead and the concern about climate is alive and well in the world. The COP21 in Paris has shown that. So, the Paris conference is a victory because it showed the resilience of the climate movement. We have been attacked, ridiculed, demonized, harassed, insulted, dismissed, threatened, punished, and more. But we are still here. And we are growing. We are also getting smarter. We haven't won, yet, but we are learning how to win. So, "they" must be thinking: what was all that money good for? Don't you think they are now thinking about whether putting some more money into a losing battle is a good idea? They may even be scared: it is shown by the reactions to the news of the agreement. Sometimes nasty, sometimes silly, sometimes rabid; always in a defensive mood. Look at this report, where the secretary general of Eurocoal has declared that the coal industry “will be hated and vilified, in the same way that slave traders were once hated and vilified" If this is not panic, what is? This story reminds me of something that Peter the Great said after he was defeated, one more time, by the Swedes, "eventually, they'll teach us how to beat them". Then, there came the Russian victory at Poltava and the Swedes never were again a threat for Russia. In war, just as in most things in life, persistence is the essential quality. If we keep fighting, we'll win the climate battle. Scenarios are not predictions, just ways of describing possible futures; useful in order to be prepared for unexpected events. The only rule in scenario building is that the assumptions should not be too improbable; such as involving time machines. And, yet, it seems that in some cases involving climate projections, time machines are a built-in assumption. The COP21 conference in Paris has brought again climate to the attention of the public and, from now on, there starts the real challenge: what can we really expect for the future of the earth's climate? As always, predictions are difficult, especially when there are many variables involved. Nevertheless, climate change is the result of physical factors that we can understand and we know that the build-up of greenhouse gases in the atmosphere - if it continues - is going to lead us to a very unpleasant future. If we look at the long-term future, the whole question rotates on whether we manage to stay below an increase in temperature that is believed to be "safe" (it might be 2 degrees C, but we don't know for sure), or we pass the limit and we find ourselves above the "climate tipping point" after which the system starts moving by itself toward more and more warming with all the associated disasters. So, I thought I might engage in a little exercise of qualitative "scenario building" with a special focus on climate. Here are some scenarios; listed in no particular order. Some you could see as horrible, some as unlikely, others as overoptimistic. But they are just that: scenarios. The COP21 was a step in the right direction. Avoiding the worst outcomes will not be easy, but it is up to us. 1. Business as usual. In this scenario, things remain mostly as they are today; just gradually worsening. There are no major wars, no abrupt economic collapses, no sudden climate disasters. But temperatures keep increasing while the world's economic system is battered by one crisis after the other. So, the economy gradually loses the resources necessary to keep alive the structures that study and understand global problems: universities and research centers. As a consequence, global problems slip away from the collective consciousness. 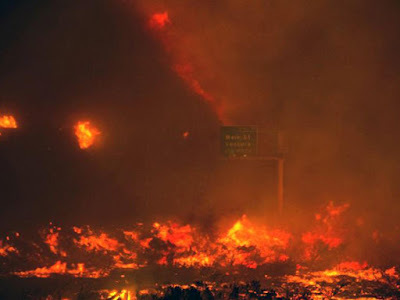 People get killed by heat waves, starved by droughts, and swept away by monster hurricanes, and still no one is able to connect all that to climate change, while the burning of fossil fuels, although reduced because of depletion, continues. In the long run, that would lead to the end of civilization by a whisper, rather than by a bang. 2. The climate panic. This is the symmetric and opposite scenario to the above. As the climate crisis gets worse, we may arrive at a "perception tipping point;" maybe generated by some spectacular event (e.g. a monster ice calving from Antarctica or Greenland) or, simply, by the accumulation of evidence. A wave of climate panic would lead to a scramble to "do something" and things might worsen rather than improve if some extreme forms of geoengineering were attempted. However, it might also lead to positive results. For instance, a push for reforestation and for renewable energy would effectively mitigate climate change. It is not obvious that our civilization needs a burst of panic to be saved, but that might give us an extra chance. 3. 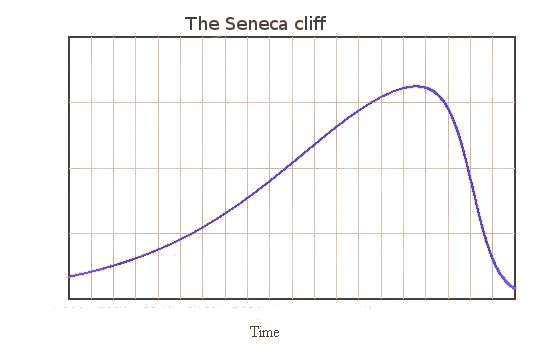 The Seneca collapse. Before being hit by some climate disaster, the world's economy could experience a "Seneca collapse" as the result of resource depletion. such a situation, people would have no time to worry about anything but their immediate survival and that would lead to climate change being completely forgotten. On the other hand, the economic collapse would cause a reduction in emissions probably well beyond even the wildest dreams of environmentalists and might be sufficient to avoid to go above the "climate tipping point". Then, of course, such a collapse would be a disaster in all other terms; causing the probable disintegration of the whole world's economy. Nevertheless, it might still give us a "window of opportunity" to restart from scratch with a new renewable energy infrastructure and then rebuild a new and better society. 4. The warring states. The present situation has been likened to the beginning of the first world war and there are serious risks that the ongoing conflicts will escalate into a major worldwide confrontation. In such case, all the worries about climate change would be immediately forgotten. A major war would likely boost the efforts to extract as much fossil fuels as possible, including, probably, the oil shales that pure market forces seem to be unable to extract (it may be that the current drive for war arises in part from this kind of considerations). That would lead to emissions spiking up, at least for the duration of the war. On the other hand, it is likely that any major war would rapidly peter out because of the lack of energy and resources to carry it on. So, the carbon spike won't last long. Still, it could do a lot of damage, making things even more difficult. 5. The nuclear holocaust. A variant of the war scenario, it assumes that one or more contenders would decide to play the nuclear card. That could take the shape of tactical or strategic nuclear bombing or also that of attacking the adversary's nuclear plants utilizing conventional weapons. In all cases, we would see a rapid drop of the carbon emissions as large industrialized areas would be destroyed or just rendered uninhabitable. A massive nuclear exchange would also generate so much dust in the upper atmosphere that the result could be described as a "nuclear winter" causing an extreme cooling that might do even more damage than warming. However, that would do nothing to change the long-run effect of the greenhouse gases already emitted in the atmosphere. The dust would eventually settle down and the warming restart with a vengeance. 6. Depopulation. Most current projections assume that the human population will keep smoothly increasing throughout the 21st century, plateauing at around 9-10 billion individuals, or perhaps more than that. However, the historical record shows that human populations rarely follow this kind of trajectory, more often tending to collapse after having peaked. A good case in point is that of Ireland, between 1845 and 1850, when population crashed to about half of the size it had at the peak. The world's population might collapse in the same way as the result of wars, epidemics, pollution, of someone playing games with biological weapons and it might not be impossible to lose several billion people in a few decades, or even faster. The result would be a strong reduction of the greenhouse gas emissions, albeit obtained at a price that nobody would want to pay. However, people would continue burning fossil fuels and the cumulative amount of the greenhouse gases in the atmosphere would continue increasing. So, it is not obvious that even this extreme scenario could lead to avoiding the climate tipping point. 7. The renewable revolution. Renewable energy is the wild card of the situation. 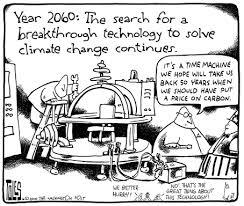 It is already efficient enough that it can outcompete fossil fuels and it could grow fast enough to replace them before it is too late. Assume that people understand both the advantages of renewable energy and the desperate need we have to stop burning fossil fuels, then we could arrive at a "bottom-up" revolution in which we don't need government-enforced emission trading or a carbon tax. A situation in which even climate science deniers wouldn't be so silly to pay more for dirty fossil energy when they can have cheaper and clean energy. In the end, the battle for climate would be won when a consortium of renewable companies buys Exxon and closes it down. Problem solved and it is the beginning of a new era. We could combine some of these scenarios together, or think of different ones. The only rule is that they shouldn't be too improbable. For instance, we shouldn't include scenarios dealing with an alien invasion of the planet or with the COP97 being held in Siorapaluk, in Northern Greenland, in 2074 finally arriving at a binding treaty on the phasing out of fossil fuels. Apart from this, the future always surprises us. Just don't forget that the future cannot be predicted, but that you can be prepared for it. Art Berman reports on his blog the latest data from IEA. These data speak volumes about what has been happening in the oil markets during the past two years or so. The whole thing seems to have gone out of control, with everyone pumping as much as possible, worrying only about harming competitors and without too much concern about the overall disaster caused by overproduction. The excess has stimulated demand, but only weakly. The result has been the collapse of the oil price, that we are still seeing today. It seems, now, that the market is slowly redressing the unbalance. Demand is growing, and supply seems to have peaked in July 2015. In a few months, we may go back to a situation where demand matches supply, at this point we'll see prices rising again. We'll likely see production going down, and the whole system regaining some kind of balance; at least for a while. For sure, the main element in the readjustment is the decline in the production from shales in the US (image from Ron Patterson). 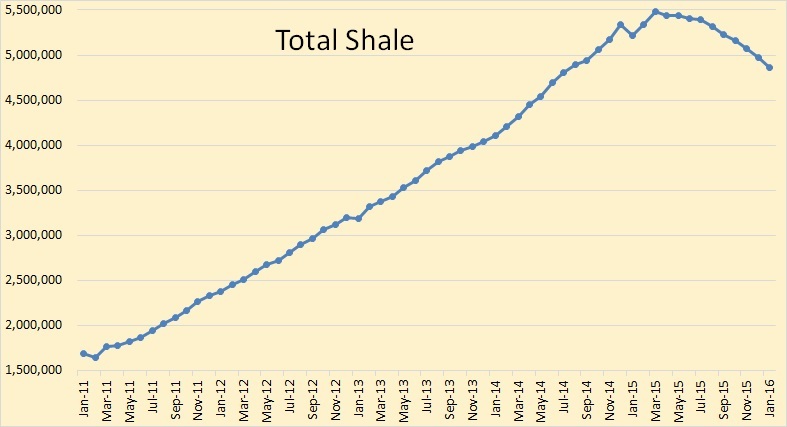 Is the July peak "the" peak for all combustible liquids? We can't say yet, what we can say is that the period of oil glut has done a tremendous damage to the industry. Perhaps, we are starting right now the terminal decline of the world's oil industry; but we still have to wait to be sure. Americans, it seems, love boom and bust cycles and, if prices go up again, they might want to pour again money into the shale industry. The only sure thing is that fossil fuels must go, sooner or later. Eric Cline wrote an excellent book on the end of the Bronze Age in the Mediterranean region but, unfortunately, it doesn't arrive to a definite conclusion about the reasons of the collapse. Cline suggests that "several stressors" worked together to ensure the demise of this civilization. But this is very disappointing, to say the least. It is like a murder mystery where, at the end, we are told that the killer of Miss Scarlett could have been Professor Plum, Mrs. Peacock, Mrs. White, Reverend Green, or Colonel Mustard but, really, it seems that all of them simultaneously stabbed her. Imagine a team of archaeologists living three thousand years in the future. They work at digging out the remains of an ancient civilization on the Eastern shore of the Mediterranean Sea, a region that its ancient inhabitants called "Syria." They find clear evidence that the Syrian civilization collapsed in correspondence of a series of disasters: a severe drought, a civil war, the destruction of cities by fire, foreign invaders, a reduction in population, and more. The evidence for these events is clear, but what exactly caused them? Our future archaeologists are baffled; they suspect that there is a single reason for this coalescence of disasters, but they can't find proof of what it could have been. One of them proposes that it had to do with the fact the ancient Syrians were extracting something from underground and using it as a source of energy. But, without reliable data on the production trends, they cannot prove that oil depletion was the basic cause of the Syrian collapse. Something similar is happening today to the archaeologists who try to understand the reasons of the collapse of the Mediterranean civilization of the end of the second millennium BCE; the end of the Bronze Age. We have archaeological evidence of a brilliant and thriving civilization: palaces, works of art, commerce, metallurgy, and more. But we have also evidence that this civilization met a violent end: there are traces of fires destroying palaces and cities, there is evidence of droughts and famine, and some of the people living in the region, the Hittites for instance, disappeared forever from history. But what caused the collapse? That's a very difficult question. Eric Cline's book, titled "1177 BC" shines some light on the history of the Bronze Age civilization and its demise. As a book, it is well done and it summarizes very well the result of nearly two hundred years of archaeological studies. It is a fascinating story of a time that strikes our imagination as a refined and sophisticated world; not an empire, but a loose federation of peoples. Sometimes they were engaged at warring with each other, but more often in commerce and in cultural exchanges. We can't imagine that such a sophisticated civilization would collapse so fast; possibly in just a few decades. And yet, it did. 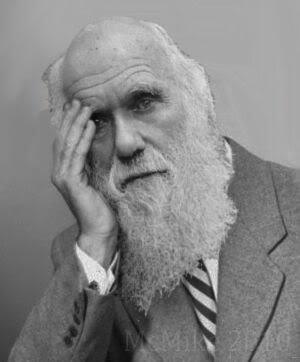 "There probably was not a single driving force or trigger, but rather a number of different stressors, each of which forced the people to react in different ways to accommodate the changing situation(s).... a series of stressors rather than a single driver is therefore advantageous in explaining the collapse at the end of the Late Bronze Age." Unfortunately, this is far from being satisfactory. Suppose that I were to tell you "I am suffering of a number of different stressors, including fever, throat ache, sneezing, coughing, pain at the joints, and more." Then, you would look at me, perplexed, and say,"you mean you have a flu, right?" Yes, of course, all these different "stressors" result from a single cause: a viral infection. Just like a flu is a common illness in humans, collapse is such a common feature in human societies that we can hardly imagine that it could be caused by a fortuitous combinations of stressors, all acting in the same direction. In examining this issue, a basic point is that societies are complex systems, and need to be understood as such. Unfortunately, the knowledge about complex system has not yet permeated the study of societal collapse, as it is amply demonstrated by the discussion in the last chapter of Cline's book. Several authors have apparently tried to explain the collapse of the Bronze Age society in terms of what they call "complexity theory". But I am afraid they didn't understand the theory very well. Just as an example, in Cline's book we read a sentence taken from the work of Ken Dark who says ""The more complex a system is, the more liable it is to collapse." Now, this is simply wrong if it is applied to human organizations as complex systems, such a companies, or civilizations. And you don't need to be an expert in complex systems to note that large and very complex systems tend to be more resilient than small ones. Compare, for instance, IBM with the large number of small upstart companies in information technologies that appear and quickly disappear. So, you just can't invoke "complexity" as a mumbo-jumbo to explain everything, as, indeed, Cline correctly notes in the book. A lot of confusion in this area has arisen from the variability of the definition of "complex system;" there is not just one kind of complex system, there are several (and that is something you would expect since they are, indeed, complex!). One kind of complex system that has had a lot of success in the popular imagination is the "sandpile", proposed by Bak, Tang, and Wissental, a model that shows a series of small and large collapses. The problem is that the sandpile model is valid for some systems, but not for others. It works nicely for those systems which have only simple, short term interactions: the financial system, for instance. But it doesn't work at all for systems which base their complexity on stabilizing feedbacks: civilizations, for instance. The difference should be clear: the financial system was never built with the idea that it should be stable. The opposite is true for a civilization or a large company, both have plenty of feedbacks designed to keep them stable or, if you prefer "resilient". Large organizations are often more resilient than small ones simply because they can afford more stabilization feedbacks. Then, what can bring down a feedback-stabilized complex system? The answer is "a forcing that is strong enough." The term "forcing" is used in the study of system dynamics and it can be seen as having the same meaning of the "stressor" employed by Cline in his discussion. A forcing is an external factor that forces the system to adapt by changing some of its parameters. If the forcing is really strong, the adaptation can take the shape of a fast and disastrous reduction in complexity; it is what we call "collapse". So, it is starting to appear clear that civilizations tend to collapse because they lose access to the resources that created them and allowed them to exist; often as the result of overexploitation. Over and over, civilizations have been brought down by soil erosion and the loss of agricultural productivity. Then, some civilizations have collapsed because of the depletion of the mineral resources that had created them, an example is the collapse of the modern Syrian state that I was describing at the beginning of this post. Another example is the collapse of the Roman Empire, It showed a lot of symptoms that we could call "stressors:" rebellions, corruption, wars, invasions, depopulation, and more. But they all originated from a single cause: the depletion of the gold mines of Spain which deprived the Imperial government of its fundamental control system: gold and silver coinage. At this point, we can conclude that, most likely, there never were a combination of parallel stressors that brought down the Bronze Age Civilization. Rather, there was some basic factor that generated the various catastrophes that we observe today in the archaeological record. The problem is that we don't know what this forcing was. There are elements showing that climatic change played a role, but we lack sufficient evidence to be sure that it was "the" cause of the collapse. So, perhaps it was mineral depletion that brought down this civilization? Maybe, and we can note how the defining term for this age is "bronze" and in order to have bronze you need to alloy copper with tin. And we know that there was plenty of copper available from mines in the Mediterranean region, but no tin; it had to be transported from a long and probably precarious supply route from the region we call Serbia today, or maybe from the Caucasus. If the people of the Bronze Age used bronze as currency, then their commercial network would have been badly disrupted by an interruption of the supply of tin. So, they might have been destroyed by the equivalent of a financial crisis. Even though we cannot arrive to a definitive conclusion, the story of the Bronze Age civilization is part of the fascination we feel for the subject of civilization collapse. It is a fascination that derives from the fact that we may be seeing our "Western" civilization starting right now its final phase of collapse, after having badly depleted its sources of energy and generated the disastrous disruption of the ecosystem that we call "climate change." In our case, unlike for civilizations lost long ago, we have all the data we need to understand what happening. But we still don't understand collapse. In the 1950s, a series of crashes affected the "Comet," a plane that was supposed to be a major innovation in aviation. The main reasons of the disasters can be attributed to the general atmosphere of technological optimism that pervaded the 1950s and that led engineers to overestimate their capabilities. 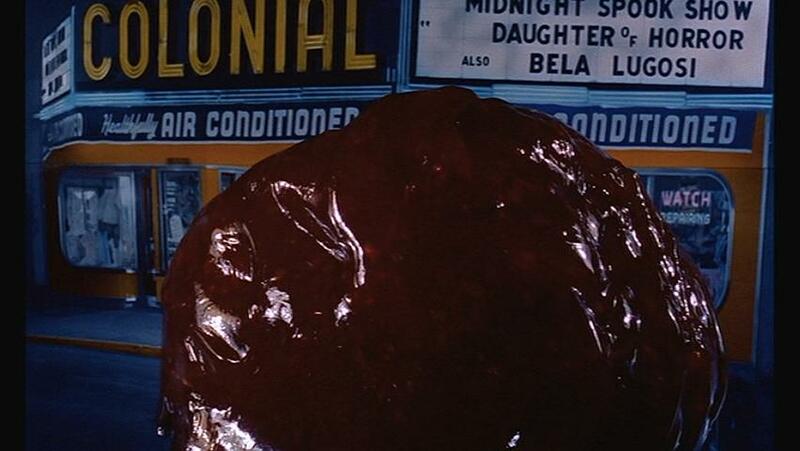 The Comet was a hard lesson to learn, but it was learned. Today, the industry is extremely conservative and modern planes are way safer than they used to be. Several years of work with materials for turbine engines have taught me how careful is the aerospace industry about the safety of their products. Of course, nobody wants to think about planes crashing, not even aerospace engineers, but they must. There is no such thing as an "alarmist" in the aerospace industry. So, the industry is extremely conservative and careful; nothing goes inside a plane unless it has passed rigorous tests and having been conclusively demonstrated to be safe and conforming to the specifics. That is what makes planes one of the safest existing transportation systems. Now, imagine now to handle the management of the earth's climate to aerospace engineers. They would quickly understand that the earth's ecosystem can crash; meaning that it can warm up out of control as the result of the build-up of greenhouse gases in the atmosphere. And that can kill almost everything on the planet: it has happened in the past and there is no reason to believe it is impossible now. That would be the equivalent of a major plane crash; as they say in the industry a "hull loss." So, if the planet were a plane, it would have to be immediately grounded. Safety dictates that we should stop burning fossil fuels from now. Unfortunately, it seems that the rules that hold for the aerospace industry are not valid when it is question of managing the earth's atmosphere. Let's suppose that a plane were to be built by the methods used in Paris. How to build a safe plane according to the methods used in the COP21 in Paris. 1. A large group of politicians and bureaucrats convenes in a city in order to decide the specifics of the plane. Aerospace engineers provide advice, but they are not the ones responsible for the decisions made. 2. Those engineers who worry that the plane could crash are branded as "alarmists" and removed from the design process. Politicians not attending the conference declare that it is impossible that any plane can ever crash and that all the worries about planes crashing are only the result of aerospace engineers lobbying for fat research grants. 3. The specifics of the plane, speed, range, size, etc, are decided by a debate among politicians, while grassroots activists march in the streets asking for better planes. 4. No one designs the plane, Contractors provide their own specifics for each subsystem (wings, engine, control system,etc) in total autonomy. Nobody can say whether these subsystems will work together and whether the result will be a plane that can fly. 5. The management of the conference has no power to modify the proposals of the contractors, nor to make sure that the specifics that have been listed will actually be met once the subsystems are delivered for assemblage. 6. The conference is concluded with the politicians declaring that the plane will fly. 7. The first test flight will be performed with the plane fully loaded with passengers. So, Mr. Darwin, what is the equation of evolution? With the climate negotiations in full swing in Paris, 14 Italian scientific societies got together to release a document in which they expressed their support for the COP21 negotiations and for the need of taking action against anthropogenic climate change. However, one scientific society was conspicuously missing: the Italian Society of Physics (SIF). Later on, the president of SIF, Prof. Luisa Cifarelli, diffused a statement on this issue as a comment to the blog of the Italian Society of Chemistry. This comment has not been officially confirmed, but neither it has been denied, so it appears to be real. Let me report its initial statement here, translated from Italian. The SIF is an association of physicists used to consider physical laws determined by equations of varying degrees of complexity and results expressed with appropriate confidence or likelihood levels. This is, after all, the scientific method. Then, Professor Cifarelli goes on, stating that the Italian Society of Physics refuses to sign a document in which some statements are given as certainties and not as possibilities, and that science cannot be based on consensus and on "mixing science and politics". She concludes that it is important that the earth is protected from pollution, but that the study of climate should be "based on physics." And so, here we stand. What Prof. Cifarelli is saying is that science is science only if it is based on equations. Therefore, since an "equation of climate" doesn't seem to exist, climate science is not a science. In a single stroke, Prof. Cifarelli has removed from the category of legitimate sciences everything from earth sciences (what is the equation of dinosaurs?) to the study of complex systems (what's the equation of Bak's sandpile?). This is something that deserves a facepalm for the whole Italian physics community. Even though several Italian physicists have strongly criticized the behavior of SIF in this occasion, it remains a hard blow for the prestige of the Italian research community. Even more so considering earlier blows such as the initial support given to the "E-Cat" by the Department of Physics of the University of Bologna. But it is worse than that. In a moment in which we all badly need to support the work of climate scientists to promote an indispensable change in our policies, it seems that some scientists tend to cling to obsolete paradigms, for instance about the human influence on climate. True, obsolete paradigms tend to be removed from science by the progress of knowledge; but it takes some time, as this story shows even too well. Note: after writing this text, I noted a comment signed by Luisa Cifarelli to the blog of the Italian Society of Chemistry. It says, in Italian "Eppure Lei sa bene che la Groenlandia era verde in tempi non sospetti." Translated, it is, "and yet you know well that Greenland was green in times above suspicion". I cannot be sure that this sentence was written by the president of the Italian Society of Physics but, if it is the case, it is worth another facepalm. 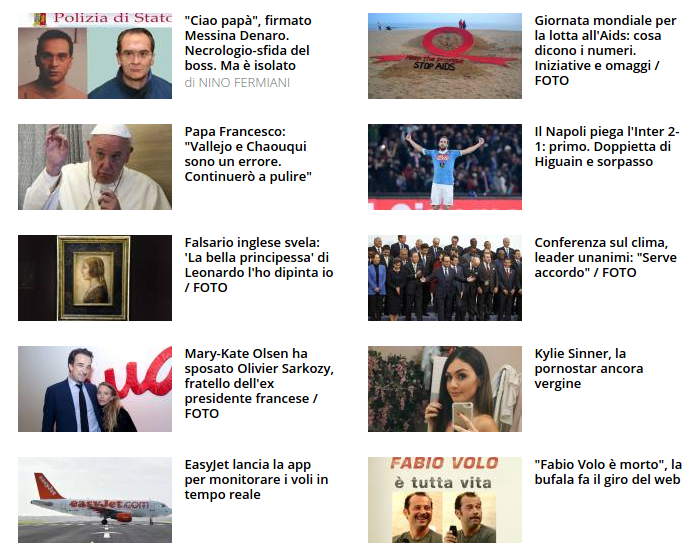 Can you spot the box about the climate negotiation in Paris in the site of the Italian newspaper "Quotidiano.Net"? It takes a certain effort, but it is right there, the third in the right column, just below the news about soccer and just above the news about a pornstar. In the image on the right, you can have a better idea of the prominence given by QN to the Paris conference (look at the text circled in red). And QN, a major coalition of newspapers in Italy, is not alone in ignoring the COP21. Here are the results of a brief survey that I made on the web pages of the major Italian dailies today. La Repubblica. "repubblica.it" (the main "progressive," so to say, newspaper in Italy). The climate negotiations are the n. 7 in the list of the news. The first is terrorism, then there is the Pope, the need of economic growth, something about AIDS, scandals in Rome, etc. La Stampa. "lastampa.it" Mainstream "moderate" newspaper: the climate negotiations are n. 12. Il Corriere. 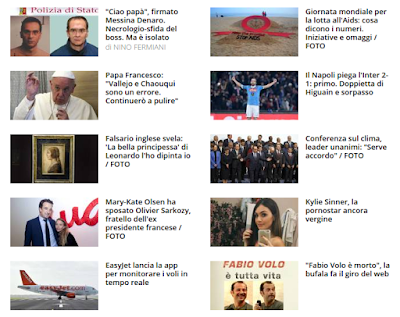 "ilcorriere.it". Moderate newspaper. One brief paragraph mentions Hollande's declarations on terrorism and climate. It is n. 3 in the list. Libero. "Liberoquotidiano.it" (extreme xenophobic right) - no mention of the climate negotiations. In terms of communication success, this is not an auspicious start for the climate negotiations. Better said, it is a complete flop, at least in Italy.